Facebook Ads vs Google AdWords - Which Advertising is Better for Your Business? Facebook Ads or Google AdWords Advertising – Which is Better for Your Business? It’s a question so many businesses ask me when approaching online advertising: Should I put my money in Facebook Ads or Google AdWords? 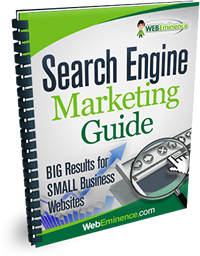 These massive, high-volume sites can have a major impact on the success of your business. So, I think there are three more questions you should ask when determining which platform is best for promoting YOUR business. How Do I Set Up Ads? How Can I Target Specific Audiences? Questions #1 – Where Will My Ads Show? When you purchase Facebook ads they can appear on Facebook.com, the Facebook App, and on Instagram (which Facebook owns). When you scroll through Facebook (as Americans spend millions of hours per month doing) you may notice a Sponsored Post in the middle of your feed. That’s an ad and may be either video or image advertisements. You will likely also encounter some Sponsored ads on the right-hand side bar that are usually highly targeted and tailored to you depending on your web search history and Facebook usage. 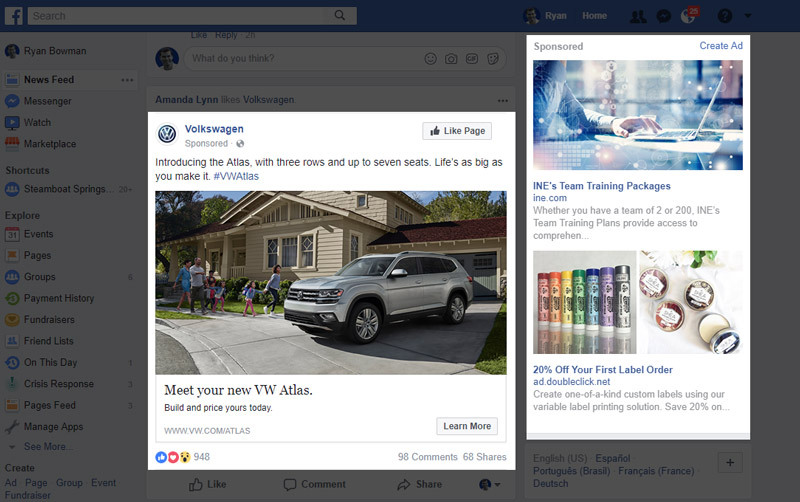 Looking at the ads you encounter on Facebook yourself will give you a good idea of how your own ads will be displayed to your audience. Google ads work much differently compared to Facebook. When you type something into the Google search bar, your top results will likely be ads. You could also see map listings, a business listing on the side bar, and more ads toward the bottom of the results page. These are text ads and are considered Search Network ads. Search Network ads are probably what most people think of when they think of Google ads. They look a lot like the “organic” listings below them but they even though Google has been prone to change HOW they are labeled, they have always been labeled as and “Ad” in some form. Google AdWords also allows you to show ads on their Display Network. 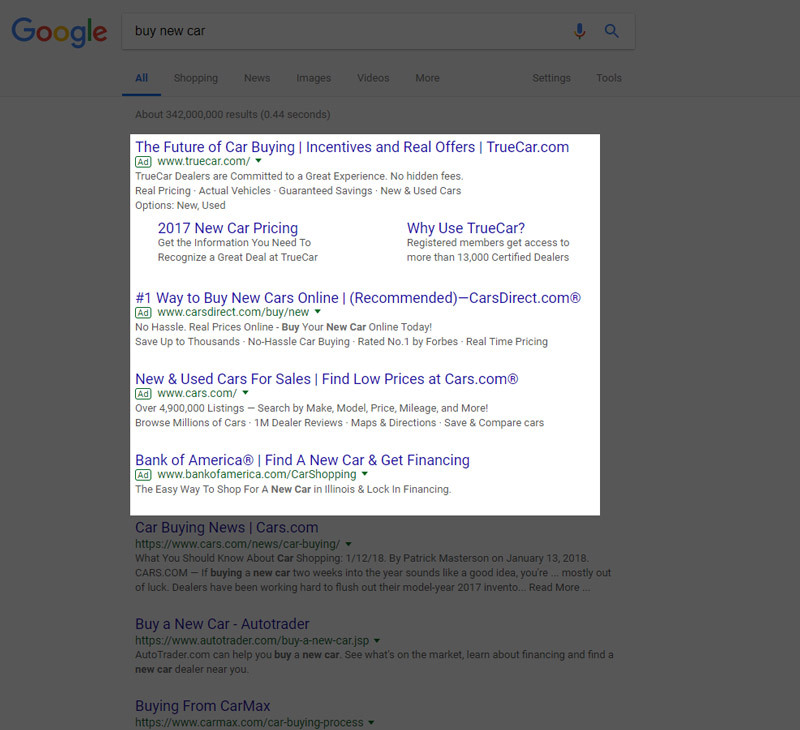 When you browse your favorite website and see image ads, there’s a good chance you’re looking at ads served up by within Google’s Display Network via Google AdWords. These display ads work like search ads in that when they are clicked, you are taken to the advertiser’s site. I go into detail on the difference between these two Networks in my video Google Display Network vs Search Network – What’s the difference?. So check that out to get more information and visualize the difference between the two. Note: With Google AdWords you’re also given the option to place video, image, and text ads on YouTube. Question #2 – How Do I Set Up Ads? Setting up ads on both Facebook and Google is fairly simple initially, but can get very complex if you dive in deep. It’s much easier to navigate when you have a visual reference. Fortunately, I have you covered! 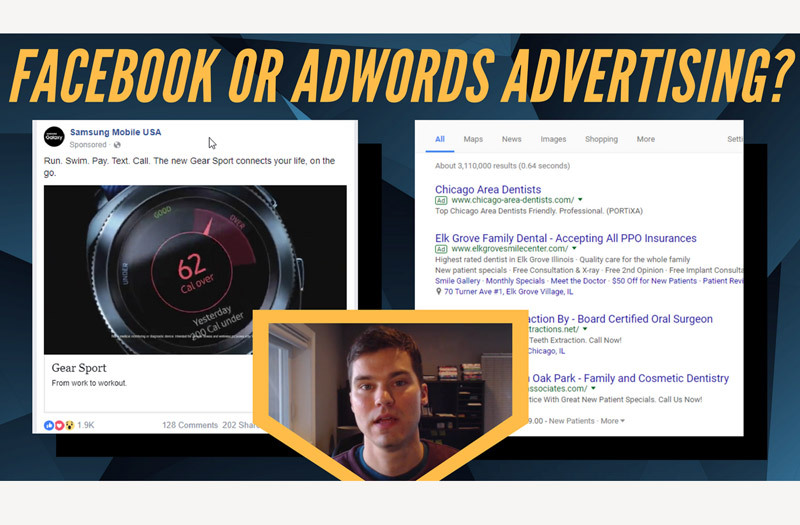 The video above will show you exactly where you need to click on both Facebook Ad Manager and your Google AdWords dashboard to create new ads and campaigns. For me to go any deeper here would require another 1,000+ words and another blog post! (stay tuned). Here’s a quick tip if you don’t have time to watch my video but want to get started – if you want to setup Facebook Ads, go to “Manage Ads” in the top right of your Facebook account. For Google Ads, you’ll have to sign up for Google AdWords. The options each platform gives you for targeting specific audiences will likely be one of the biggest factors in deciding which ad platform is best for your business. The first option you have when creating a new Facebook Ad campaign is determining the goal of your ads. Are you looking for Reach or Brand Awareness? Do you want to increase Traffic, the number of Messages you receive, or boost User Engagement? Now is the time to make these important decisions. You’ll also need to decide if you want to drive traffic to your Website, to an App, or to to your Facebook page. Now we move on to what is one of Facebook’s most powerful advertising tools: the ability to specifically target your audience by demographic and interests. You have a lot of options for determining whose eyeballs you want in your ads. You can determine location down to the city, zip code, and even mile radius of your business. You can also target based on gender, language, and age. And probably most important, you can target by interests. You can browse specific interests to get your ad right where you want it. You wouldn’t want to promote wedding planning to pre-teens, would you? Putting your ads in front of people specifically based on what clothes they like, where they like to eat, etc. can maximize the effectiveness of your ads. Setting up new campaigns in AdWords is similar to Facebook Ads at first. You’ll first determine the goal of your campaign. Do you want to drive Leads or Website Traffic? 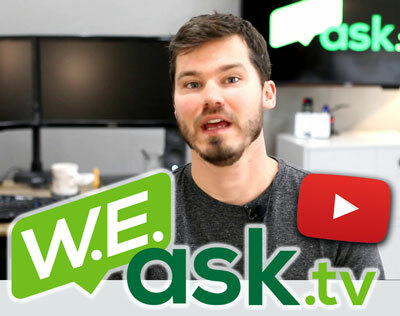 Do you want to invest your budget into the Search or Display Network, maybe even YouTube? 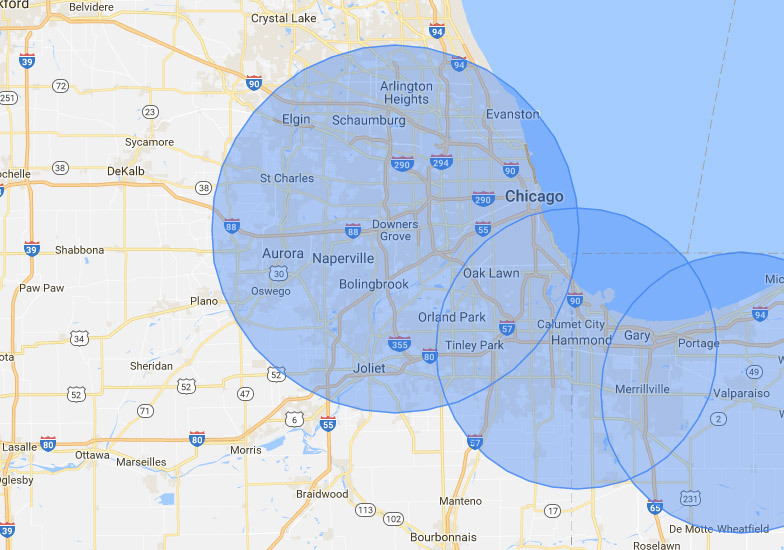 Similar to Facebook, you can target languages and locations down to the zip code and mile radius with Google AdWords campaigns..
Once you’re creating ad groups in Google AdWords, the difference between Google and Facebook comes into clear focus. You’re not targeting demographics but instead determining the keywords that are likely to be searched when looking for your business. This keyword targeting is the power, the secret sauce, “the Force” of Google AdWords and why Google dominates in search advertising. Google searchers are searching for exactly what you have to offer and you can target them down to the very phrase that communicates their interest. AdWords will even offer suggested keywords that will give an idea of which keywords might work for you and which ones are being searched more often than others. I’ve done a lot of videos based around AdWords from Conversions 101 to Message Match to Budget Strategy. I’d suggest giving them a look to really get the most from AdWords. So, Do I Choose Facebook Ads or Google AdWords? This question is what brought you all here, so let me give a straight answer. Facebook might be better if you have a product or service that many people have never heard of. I mean, how could they search for your Blue Super Widget 5200 if they’ve never heard of it?! So, in this case, Facebook could be an effective way to raise awareness and allow your audience to discover something they never knew they needed. Facebook (and the Google Display Network) also work well if you’re a large brand trying to target a very specific demographic by age and gender. But it’s also good for very small local boutiques and other very visual businesses that are trying to build a following within a small mile radius of their business. The reason I say a visual business on social makes sense is that a flower shop has more potential to generate social shares and buzz than a tax professional down on Main Street. Google AdWords works best for those with a general business or service, something someone knows they need but don’t know the best place to get it. Think about people in a specific city searching for a doctor or attorney. They’ll often search for something like “pediatrician in Chicago” instead of a specific office of practice. This is precisely where Google AdWords can be utilized to show a targeted text ad right when someone is searching. My suggestion would be to dip your toes into both Facebook Ads and Google AdWords before diving headfirst into either. You never know which might get the best results for your business! Questions? Ask them below in the comments!